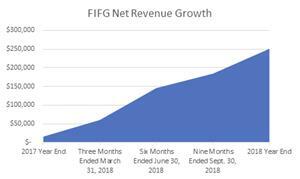 Net Revenue Grew by 1,498% to $251,083 for the Year Ended December 31, 2018. Assets Grew by 106% to $680,179 as of December 31, 2018. The Company has No Convertible Debt. Results Were Positively Impacted by Syndicated Participation in Merchant Cash Advances, which Grew by 279% to $562,488 as of December 31, 2018. Results are supporting the expansion of the Company’s Holy Cacao subsidiary, including a new manufacturing consulting agreement and a Facility Access and Wholesale Production Purchase and Sale Agreement. New York, NY, April 16, 2019 (GLOBE NEWSWIRE) -- via NEWMEDIAWIRE -- First Foods Group, Inc. (OTCQB: FIFG) (the “Company”), a fully reporting entity with growing interests in the food and food service industry, reported net GAAP revenue of $251,083 for the year ended December 31, 2018, representing an increase of 1,498% over the net GAAP revenue of $15,708 reported for the year ended December 31, 2017. Total assets as of December 31, 2018 were $680,179, representing an increase of 106% over total assets of $329,790 as of December 31, 2017. The Company has no convertible debt. The Company has deployed its available funds by increasing its syndicated participation in merchant cash advances by 279% to $562,488 as of December 31, 2018 from $148,253 as of December 31, 2017. The Company’s financial results are supporting the expansion of its Holy Cacao subsidiary, which is primarily focused on developing its specialty chocolate line and related intellectual property. The Company has developed twenty-three (23) proprietary recipes that have been tested in a fully staffed and fully equipped state of the art manufacturing facility. The Company has also obtained a trademark from the United States Patent and Trademark Office (“USPTO”) for “The Edibles’ Cult” brand and has submitted multiple applications to the USPTO for additional brand names, including “mystère” among others. These efforts have culminated in two Holy Cacao agreements, including a Consulting Agreement with a consultant to assist in the manufacturing, packaging and distribution of the Company’s specialty chocolate product line and a Facility Access and Wholesale Production Purchase and Sale Agreement that allows the Company to begin commercial production of its specialty chocolate product line and allows its first commercial buyer to begin submitting purchase orders to the Company. The Company is currently pursuing licensing agreements for its intellectual property, including its brand and packaging. First Foods Group, Inc. (the "Company" or “First Foods”) is a smaller reporting company focused on developing its specialty chocolate line and participating in merchant cash advances through its 1st Foods Funding Division (the “Division”). First Foods continues to pursue new foodservice brands and menu concepts. This press release includes "forward-looking statements" within the meaning of Section 27A of the Securities Act of 1933, as amended and Section 21E of the Securities Exchange Act of 1934, as amended, that are based on the current beliefs of the Company’s management, as well as assumptions made by, and information currently available to, the Company. Such statements reflect the current views of the Company with respect to future events and are subject to certain assumptions, including those described in this release. In addition to statements which explicitly describe such risks and uncertainties, readers are urged to consider statements labeled with the terms "believes", "belief", "expects", "intends", "anticipates", "will", “should”, “could”, “might”, “potentially” or "plans" to be uncertain and forward looking. The forward-looking statements contained herein are also subject generally to other risks and uncertainties that are described from time to time in the company's reports and registration statements filed with the Securities and Exchange Commission.